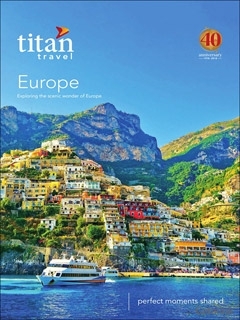 To order a printed copy of the Titan Travel: Europe brochure, simply click the Request button below. With a wealth of cultural and historical intrigue and landscapes that captivate the imagination and enrich the soul, Europe's boundless opportunity is best explored with a delicate itinerary that balances freedom and adventure with thorough destination knowledge and local expertise. Titan's extensive knowledge and customisable packages will guarantee that, whatever country or culture you want to experience, their spectacular range will include your ideal trip. Europe's diversity and range is sure to inspire any budding traveller but if you're unsure of where to choose, trust in the experience and knowledge of Titan's meticulous team. Tantalising packages include differently themed and specialised trips across countires which include Italy, Spain, Portugal, Germany, Turkey, Croatia, Russia, Scandinavia and many more. Sample the myths, legends and romance of the Swiss lakes and the meandering Rhine, experiencing a comprehensive journey into the fascinating history, rich heritage and picturesque villages which stretch across the stunning landscape. Why not immerse yourself in the passion and vibrancy of Andalucia and explore the beautiful art and architecture of a spectacular region? Or, if you're feeling indulgently adventurous, experience the trip of a lifetime and take off on an all–encompassing Grand Voyage across Europe. Traverse 900 miles of breathtaking countryside and culture from Amsterdam to Vienna and enjoy the pleasures of tantalising local cuisine and the luxury of an exclusive chartered vessel. Whatever your experience of travelling or your knowledge of European culture, Titan's unwavering commitment to quality, innovation and versatility will ensure that their collection will offer packages, themes and destinations to suit everyone. To find out more, order your Titan Europe brochure now and be prepared to be amazed. From fully-escorted group, adventure and luxury tours, plus private tours and bespoke tailormade holidays, the leading China experts, award-winning Wendy Wu Tours have China covered. Get the best deals, sales and discounts sent directly to your inbox. You&#39;ll even get exclusive subscriber discount codes too &#8211; perfect for last minute inspiration or for getting the most value for your trip. By pressing the Request Printed Brochure button you give consent to Titan Travel: Europe (and their Data Processors for the specific purpose of delivering your literature) to send you their Brochure .